MISHNA: All slaughtered offerings that were slaughtered not for their own sake, i.e., during the slaughtering the slaughterer’s intent was to sacrifice a different offering, are fit, and one may continue their sacrificial rites and partake of their meat where that applies. But these offerings did not satisfy the obligation of the owner, who is therefore required to bring another offering. This is the halakha with regard to all offerings except for the Paschal offering and the sin offering. In those cases, if the owner sacrificed them not for their own sake, they are unfit. But there is a difference between the two exceptions. The Paschal offering is unfit only when sacrificed not for its sake at its appointed time, on the fourteenth day of Nisan after noon, while the sin offering is unfit any time that it is sacrificed not for its sake. Rabbi Eliezer says: The guilt offering too is unfit when sacrificed not for its sake. According to his opinion, the correct reading of the mishna is: The Paschal offering is unfit only at its appointed time, while the sin offering and the guilt offering are unfit at all times. Rabbi Eliezer said in explanation: The sin offering is brought for performance of a transgression and the guilt offering is brought for performance of a transgression. Just as a sin offering is unfit when sacrificed not for its sake, so too, the guilt offering is unfit when sacrificed not for its sake. The idea here is when one brings an offering, it is to be for a particular purpose. In Parashat Tzav, the sin offering and the guilt offering are juxtaposed together, and the text states “As is the sin offering, so is the guilt offering” (Vayikra / Leviticus 7:7), this places emphasis upon one placing his hand upon the head of the offering, of both the sin and guilt offerings, and confessing his sins to God and to the Priest in order to receive atonement. Sforno on Vayikra / Leviticus 7:7 Part 1 states “there is a common denominator between the chatat and the asham sacrifice. While the former atones for inadvertently committed sins for which the karet (cutting off) penalty would be in place if the sin had been committed deliberately, the asham, although not atoning for this kind of sin, does have a similar place in the pyramid of offerings, seeing the sin it atones for involves careless behavior vis a vis matters that are holy, something that one needs to be more than usually careful about. Symbolically speaking, i.e. as to their “Torah,” (instruction) they have much in common, תורה אחת.” Again we see the Torah emphasizing the importance of intention in regards to sin and guilt before God. The Mishnah follows this interpretation on the offering being unfit if not offered in an appropriate manner. This is why an offering must be presented by one’s own hand. This is about drawing near to God and details the close relationship that man has with his Creator! This week’s Torah portion speaks about the peace offerings and how all of it is to be eating by the third day, any remaining is to be burned up in the fire. We also read about the state of a person if he is ṭâmêʼ (טָמֵא, unclean) he may not eat of the sacrifice. I believe that when the Torah wrote וְטֻמְאָת֖וֹ עָלָ֑יו in verse 20, the Lord God Almighty is also teaching us something different altogether. וְהַנֶּ֜פֶשׁ אֲשֶׁר־תֹּאכַ֣ל בָּשָׂ֗ר מִזֶּ֤בַח הַשְּׁלָמִים֙ אֲשֶׁ֣ר לַיהוָ֔ה וְטֻמְאָת֖וֹ עָלָ֑יו וְנִכְרְתָ֛ה הַנֶּ֥פֶשׁ הַהִ֖וא מֵעַמֶּֽיהָ׃ 7:20 But the person who, in a state of uncleanness, eats flesh from the LORD’s sacrifices of peace offering, that person shall be cut off from his kin. The impurity spoken of here is either an intrinsic impurity (i.e. someone who suffers from a constant flow, tzaraat skin disease, or nocternal emission) or an extrinsic impurity (i.e. acquired from touching a corpse, or touching someone who suffers from a constant flow [i,e, niddah/menstral], or from someone who has tzaraat, an animal that is unfit for food, or from flying or crawling creatures that are unfit for food). Ibn Ezra says that the reference to his uncleanness being upon him (וְטֻמְאָת֖וֹ עָלָ֑יו, in a state of uncleanness) this was a reference to one having already undergone the purification process of seven days as in the example of having touched someone who was dead but has not yet gone through the sunset of the seventh day. He discusses how there is an impurity (i.e. touching the dead, unclean animal, etc) as in the list of intrinsic and extrinsic impurity, as not having a serious effect upon the soul of the person concerned. Ibn Ezra states this is more like a veil of impurity that only envelops the outside of the body of a person. He says this is why the reason of ritual immersion is sufficient to remove the vestiges of the impurity. He then makes the statement that the immersion (mikvah) would become ineffective if the impurity had penetrated the inside of the body. This is illustrated in the Torah וְהַנֶּ֜פֶשׁ אֲשֶׁר־תֹּאכַ֣ל … וְטֻמְאָת֖וֹ עָלָ֑יו “and the soul that eats … and his impurity is upon him” informs us that joining what is holy (the sacrifice) with what is impure is under the penalty of karet (the cutting off, death). The significance of this is brought out for us when Yeshua taught us how impurity comes from within Mark 7:14-23 after exposing the hypocrisy of the scribe and Pharisees. He said in Mark 7:21 For from within the hearts of men come evil thoughts, sexual immorality, theft, murder, adultery, 7:22 greed, wickedness, deceit, debauchery, envy, slander, arrogance, and foolishness. 7:23 All these evils come from within, and these are what defile a man.” (NASB) Studying the Tanach (תנך, Torah, Neviim, Ketuvim) and the Apostolic Writings, we learn the major premise of the Torah and the Apostolic Writings for all men is (i) to Love God, (ii) to Love our neighbor, and (iii) to live Moral and (iv) Ethical lives before God. All of the Torah can be distilled down to these four things. This may also be reduced further to only points (i) and (ii), loving God and loving your neighbor since loving God we will want to obey His commands living moral and ethical lives. In Vayikra / Leviticus 7:21 we read the following, כא וְנֶפֶשׁ כִּי-תִגַּע בְּכָל-טָמֵא בְּטֻמְאַת אָדָם אוֹ | בִּבְהֵמָה טְמֵאָה אוֹ בְּכָל-שֶׁקֶץ טָמֵא וְאָכַל מִבְּשַֹר-זֶבַח הַשְּׁלָמִים אֲשֶׁר לַיהוָֹה וְנִכְרְתָה הַנֶּפֶשׁ הַהִוא מֵעַמֶּיהָ: 7:21 Moreover the soul that shall touch any unclean thing, as the uncleanness of man, or any unclean beast, or any abominable unclean thing, and eat of the flesh of the sacrifice of peace offerings, which pertain unto the Lord, even that soul shall be cut off from his people. (NASB) The rabbis speak of the way this text is written asking why does the Torah chose to write וְנֶפֶשׁ כִּי-תִגַּע, a feminine way of describing the contact instead of writing איש כי יגע the parallel masculine form? Correspondingly, why does Moshe write וְאָכַל in masculine form as opposed to the feminine form ואכלה? (Or HaChaim on Vayikra / Leviticus 7:20 Part 4) The reason this is written in this way is to reveal to us that the contact with impurity was intentional and not merely accidental. This leads us to understand how the person becomes culpable of the penalty mentioned. The word נֶפֶשׁ (soul) alludes to the intentional act and is the why Moshe writes this way instead of using איש (man). This is also why in Vayikra / Leviticus 7:20 the word נֶפֶשׁ was used instead of איש. The word נֶפֶשׁ (soul) alludes to the awareness of the sinner of what he is doing. This draws us back to Parashat Vayikra and that of unintentional sins verses intentional sins, there is no sacrifice for intentional sins. This is why Teshuvah (Repentance) is absolutely necessary. This is why the Lord God is long suffering with His people such that they would repent of their sins and turn from their wicked ways. The word נֶפֶשׁ indicates that the person who committed the trespass cannot claim unawareness of doing something wrong. Just as in these verses here from Vayikra / Leviticus 7:20-21 on uncleanness, the word נֶפֶשׁ implying that the guilty party was aware of touching something he should not have touched (verse 21) or he was aware that he ate something he should not have eaten (verse 20), this exposes the hypocrisy of men in their hearts and why Yeshua said in Mark 7:21 For from within the hearts of men come evil thoughts, sexual immorality, theft, murder, adultery, 7:22 greed, wickedness, deceit, debauchery, envy, slander, arrogance, and foolishness. 7:23 All these evils come from within, and these are what defile a man.” (NASB) The reason the Torah wrote וְנִכְרְתָה הַנֶּפֶשׁ הַהִוא, “this soul will be cutoff / exterminated,” is to teach us that God will not only punish the body of the sinner by premature death, but that He will also punish his soul by death. What these things teach us is how the once saved always saved doctrine is in great error. One does not place his trust and faith in Yeshua (Jesus) and then turn and live a godless life the rest of his days, and the Lord takes him out to bring him home because he was no longer of any earthly use. This is clearly a false doctrine and should be avoided since it has no biblical basis! This is why Peter wrote what he did in his second epistle in 2 Peter 3:9 saying that the Lord is not slow to fulfill His promise as some would say, the Lord does not want anyone to be destroyed, but wants everyone to repent. The Lord does not delay the promise, as some esteem slowness, but is patient. The Lord is not slack concerning his promise, as some men count slackness, etc this is because He wants all to repent and to turn from their ways. The eventual destruction that comes is not to whisk one home (to heaven). It is the end result of being cutoff due to a life of unfaithfulness, unrepentance, and sinful living. This is what the book of Vayikra / Leviticus is teaching us in the Torah portion, we are not to live an unrepentant life before God. Our faith just doesn’t work like that, we must have faith and also be faithful to God, His Messiah, and His Word! Three times is the punishment of excision is stated in the Torah with reference to people eating holy sacrifices in a state of bodily uncleanness. This is synonymous to the unrepentant soul who thinks that he is partaking in a heavenly blessing by faith, while continuing to live a life of unfaithfulness to God and His Word. In the teaching on bodily uncleanness, Yeshua refocused us to the impurity of the heart and the need for atonement through repentance and faith! There is a great significance in these things because they are related to the Lord God working in our lives, and our striving for His righteousness. If we teach people once saved always saved, or perpetuate this false doctrine, there is the chance of leading someone right to Hell after a long life of assumption their words were enough to get them into heaven. The unrepentant life is a clear indicator that something is wrong on the inside, and that either one does not truly believe in the One God has sent to save us from our sins. There is a very broad application to this teaching today, because it may directly be applied to those who accept LGBT as a way of life and claim they have the salvation of God by faith in Yeshua the Messiah. Doing so results in an uncleanness on the inside that disqualifies the sacrifice of atonement in Yeshua. This is what the Author of the book of Hebrews was saying in Hebrews 10, “there is no longer a sacrifice for atonement for those who after knowing the truth continue to sin.” These are the reasons why the doctrine of once saved always saved is a great error! This is also why the Torah is a “must have” for God’s people to take the time to study and know what God wants for our lives. 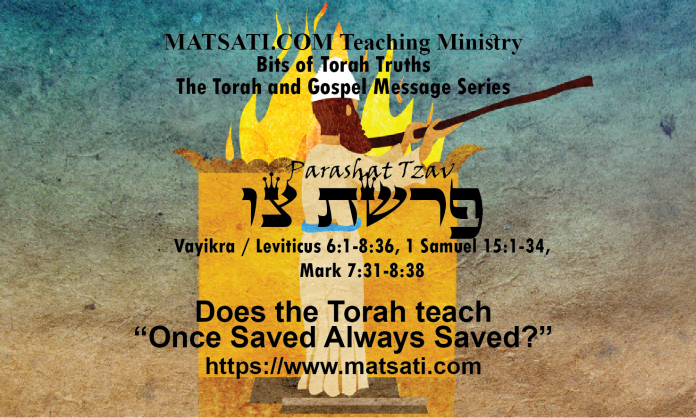 It is within this Hebraic way of thought that the Torah and the Gospel Message go hand-in-hand!